Make sure you have signed up so we can help you save on your energy bills – remember there will be no obligation to take a deal and its 100% free for you. Energy suppliers seem to be in the news all the time with stories about how people who don’t switch regularly are overcharged. It is true that if you don’t switch regularly you tend to overpay for your energy. Sign Up Now and we will keep you up to date with the best deals (100% free, no obligation to switch and £10 cash back for each fuel switched). Tell someone else to save money on their energy bills! Hopefully you are already on a really good tariff. Help a friend or colleague save some money by telling them about us! – our best saving in our collective switches was over £1741! and average savings in our collective switches are nearly always in the £200 to £300 p.a. range. We are a not-for-profit and give back £10 per fuel switched from switching commissions to help you get the best available deal. Also as a no-for-profit we try to offer you the best possible advice, rather than have our judgement clouded by commissions from energy suppliers. Find out more about why we give cashback and declare our commission. 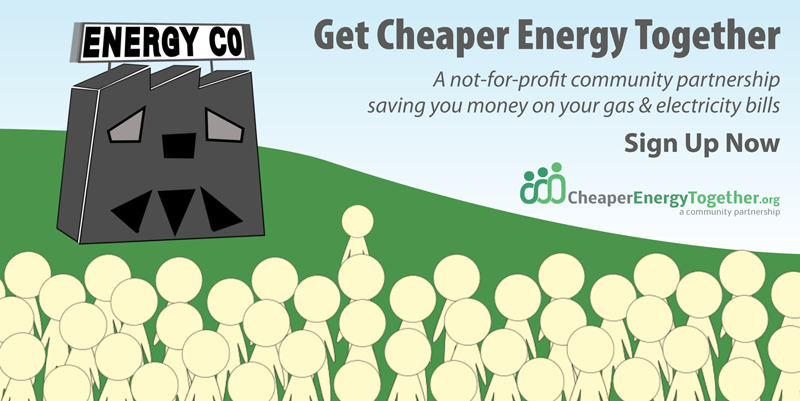 thePeoplesPower CIC is a not-for-profit organisation set up to help people get together so they can save money on their electricity and gas bills or switch to green energy. We believe it doesn’t need to be a choice between cheap energy and green energy. Find out more about us. Top saving in our last collective switch was an estimated £896 per year PLUS £20 cashback. Its an unfortunate truth in our current energy supply market that being a loyal customer to an energy supplier is likely to cost you hundreds of pounds.